Attorney Dexter Kaiama will point out illegalities at every step of Hawai’i’s path to becoming part of America. 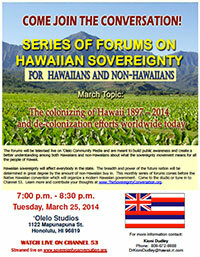 Williamson Chang, professor at UH Law School, will discuss the strong Hawaiian resistance at each of these stages. Attorney Poka Laenui, Fred Cachola (longtime extension education chief at Kamehameha Schools), and Dante Carpenter (Democrat Party chair and former Big Island Mayor), will discuss the Colonization of Hawai’i. Professor Manu Kaiama will show the large number of countries that have been decolonized worldwide in the last twenty-five years. Dr. Kioni Dudley will facilitate the forum. Also on ‘Ōlelo Channel 53 (live). I would like to participate in the discussion from the Kuleana and Konohiki point of view in an open forum. Please call me at 692-6901 to arrange a time for the discussion. Kia ora whaea Dawn its Ropata here.